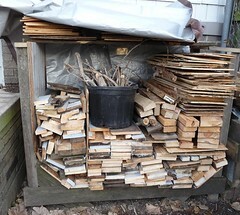 I should call it more like the "burn rack" since this construction project was began as a means to hold the scrap wood from the dog house that we can burn. I did construct a small burn pit too, but it's nothing special. I'm sure I'll redo it someday and it will be "nice". Anyway this is the rack I built. And this is it filled up with the scrap pieces. 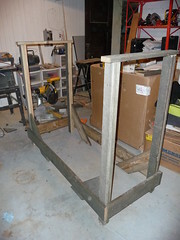 I pretty much followed the directions found at Popular Mechanics - How to Build a Cheap, Good-Looking Firewood Rack: 2-by-Guy. I basically followed the instructions with the exception of using scrap 2x6 wood rather than 2x4s.